The contact email address at the bottom of the page was bad. I have updated it with the current one. Note from Blair Baker: have added several new names and updated many of the current ones, thanks to the painstaking research recently conducted by Ruth Young of Jamaica Twp., Vermilion Co., IL (see Sources at the bottom of this page). I asked Ruth to focus on the spouses and descendents of Apollos S. Baker and I received an abundance of additional information including Henry Speers Baker. In addition to what has been added to this page, Ruth provided extensive information for the Voorhees line. For the complete notes provided by Ruth Young, click here (Adobe .pdf format). 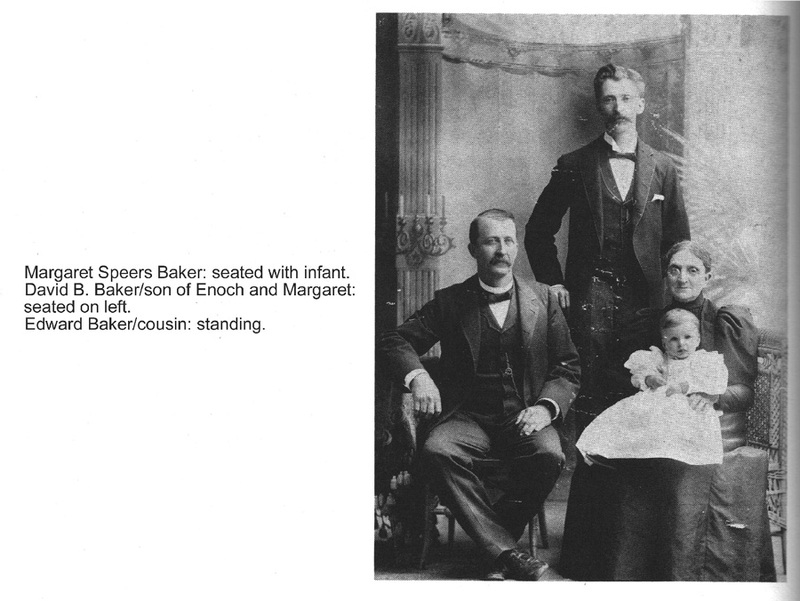 The following is small snapshot based on extensive genealogical research into the following Baker family line covering over 300 years. Should you have any questions or need additional information, just e-mail me and I will be happy to respond. I have numerous artifacts, pictures and other items I will be glad to share with you. Please report any errors. Good luck in your search! If you don't have the Acrobat Reader installed on your system, click here to go to Adobe's web site and download it for free. Or, send me an e-mail and I can provide the documents in any format you want. To search this page for a particular name, simply click the "Edit" button at the top of your web browser, then click "Find" from the drop down menu and follow the instructions. The identity of the ancestors of the following Bakers are currently in doubt. Several resources indicate 2 different possible scenarios and until further research or discoveries uncover anything new, these guesses will not be published here. One scenario has it that this Baker clan descends generations as far back as Thomas Baker of the Weald of Kent, in Southeast England, where he bought the manor at Sissinghurst in 1490. Many thanks go out to Norma Baker McCullough, for her tireless work in assembling one of the most comprehensive profiles of the Baker name. I encourage all Baker relatives to obtain a copy of her book entitled; The Bakers of Sissinghurst and Other Relatives. I am providing the book information at the bottom of this page. Note: An asterisk * indicates the particular lineage for the writer of this web page. Children: John had 4 daughters, whether by marriage to Mary is currently unknown. BAKER, JOHN. Late of Edgmond in Shropshire in old England. Husbandman. January 12, 1684. June 31, 1685. A. 19. Wife's name is not given. Estate to children Rebecka, Mary, Dorothy and Sarah. Executors: Dennis Rothford, his brother Joseph Baker and Evan Oliver. Witnesses: Joseph Brow, William Roules, Dennes Rothford. Joseph Baker and several other Baker relatives joined William Penn's Colony in the new America. Also on the trip were: John, Jr., Joseph (Sr.), Hannah, Mary and Sarah. They bought land from Penn before leaving England but he admonished everyone to barter with the Indians separately to preserve peaceful relations. Special Note: Information available for Joseph and Martha Baker and their children is quite extensive. Please e-mail me for more details. 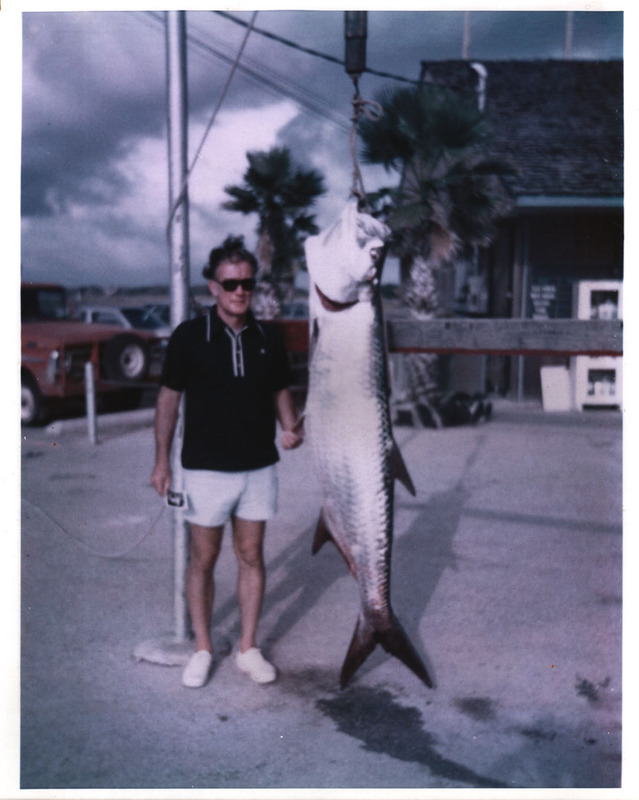 Click here to view the Last Will and Testament of Joseph Baker. JACKSON, ROGER. Chester. January 23, 1711. November 15, 1715. A. 27. To friends Joseph Baker Sr. of Edgmont and Thomas Powell of Providence all my lotts of land in and near Chichester and dwelling house and lotts in Chester and all other real estate in trust to be sold and proceeds divided among such or so many of my relations in England as shall within 7 years come over here. Executors: Thomas Powell and Joseph Baker. Letters to Baker the other being deceased. Note: Daughter of Richard and Jane Nayle Woodward of Middletown, PA. Richard (b. ca 1636, Worcestershire, England/d. Oct. 10, 1706, Middletown, PA) Jane (b. ca 1637/d. Dec. 13, 1715). Richard and Jane married ca 1669. Martha left Chester County Monthly Meeting to marry Joseph. WOODWARD, RICHARD. Middletown, Chester Co. Yeoman. September 6, 1706. January 8, 1706/7. C. 45. Other children Thomas, Jane, Mary, Sarah and Martha, wife of --- Baker. Executors: Wife Jane and son Joseph. Overseers: Sons Richard and Edward. Witnesses: Joseph Jarvis, John Worrilaw, James Cooper. Married: Francis Yarnall, Jr. (b. 3 mo. 24, 1694/d. 8 mo. 8, 1775) Jan. 25, 1717. Son of Francis and Hannah (Baker) Yarnall. He later married widow, Mary Morris. Children: Hannah, Joseph, Jane, Aaron. Married: Elizabeth Hunter, daughter of Alexander and Hannah Hunter, of Middletown, PA.
Richard died young and left a sizable estate to his widow and 3 children. Elizabeth later married Charles Moore. Married: Mary Edwards (b. 1703) on 11 mo. 9, 1727. Daughter of John and Mary (Ingram) Edwards. Residence: Settled in E. Marlborough Township, PA. Later moved to Londongrove Township, where he died. Children (known): John, Mary, Martha, Esther, Aaron and Samuel. BAKER, AARON. Londongrove. March 15, 1783. September 27, 1783. Provides for wife Mary. To the 3 children of son John, deceased, �15 to be divided. To daughter Mary �40 and to her 6 children �120 to be divided. To daughter Martha �100. To daughter Esther �100. To son Aaron 2/3 of my lands, that is 50 acres in W. Marlboro and my now dwelling plantation in Londongrove. To son Samuel 1/3 of the said land. To grandson Aaron Baker, my gun. Witnesses: Moses Edwards, Thomas Edwards. Married: James Sill, ca 1721, a sawyer by trade (b. ca 1700 in England, or Wales/d. 1774 in Edgemont Township). Son of John Sill who died in 1753, Chester County. SILL, ANN. Edgmont. September 2, 1779. No date of probate. To daughter Ann Cannady �10 etc. To son George silver buckles and sleeve buttons. To son Richard tea kettle. To daughter Mary Moris pewter plates, etc. To daughter Martha Houlston arm chair, etc. To granddaughter Ledy Sill my saddle. To granddaughter Sarah Cannady chinaware. Executors: Brother Nehemiah Baker, son James. No record of letters. Witnessed: Lydia Baker, Joseph Robins. SILL, JAMES. Edgmont. July 3, 1772. April 15, 1774. Provides for wife Ann. To son James plantation in Edgmont subject to wife's life interest. To son Joseph �20. To son Richard �20, also all interest due me at my decease. To sons George and Michael �20 each. To daughters Mary Morris, Martha Holston and Ann Kennedy �20 each. To grandson James Regester �20 for services he did for me. Executors to sell plantation in Willistown. Remainder to wife Ann and son James, also Executors. Witnesses: Nehemiah Baker, Lydia Baker, Nathan Baker. Married: Thomas Thomas ( b. ca 1702), eldest son of William and Ann Davis (Radnor) Thomas. Married: Ann Regester in 1730. Daughter of David and Lydia Regester. Buried: Probably Middletown (Hicksite) Burial Ground. REGESTER, DAVID. Edgmont. Yeoman. January 13, 1750. April 24, 1751. C. 276. To son Robert 5 shillings and to his son David my large Bible. To daughters Mary Jackson, Lydia Baker and Ann Baker 5 shillings each. To grandson David, son of Jesse Baker �5 at 21. To grandchildren Nathan and Lydia Scott �7 due from their father, John Scott. To son William wearing apparel and household goods. To son John my plantation in Edgmont where I live containing about 100 acres and all other estate. Executor: Son John. Witnesses: Abel Green, Jonathan Howell, Cad. Evans. BAKER, JOSEPH. Edgmont, yeoman. July 15, 1736. August 31, 1736. B. 7. To my mother Martha Baker the rents of my plantation in Edgmont until brother John is 21 and then I devise said land 200 acres to my brothers Nehemiah and John, subject to the charges in will of my father Joseph Baker, also �10 to be paid my sister Sarah. Remainder to brothers and sisters equally. Executor: brother Jesse Baker. Witnesses: Abraham Howell, John Taylor. Married: Benjamin Hampton (b. ca 1712) on Mar. 31, 1733; at Christ Church, Philadelphia, PA. Note: His Adm. #207, 150 1/2 with letters granted Joseph Baker and Elizabeth Baker Oct. 19, 1801. Note: He was a land owner in Thornbury Township in 1774. Letters of Intestacy granted Chester County 10-21-1778, B-275 to Joseph and Nehemiah Baker in estate of Lydia Baker. To these two were granted letters also 10-21-1778, Chester County, Will F-311 in estate of Nehemiah, Will dated 4-13-1778. BAKER, NEHEMIAH. Edgmont. April 13, 1778. October 21, 1778. Provides for wife Lydia. To daughter Mary Reece �5. To son Joseph �5. To daughter Hannah Baker �5. To daughter Lydia Richardson �10. To son Nathan the north end of my plantation now in his possession containing about 40 acres, also �5. To daughter Phebe Baker �5. To son Nehemiah my plantation in Edgmont and Thornbury where I now dwell, also stock. To grandson Nehemiah Richardson �5, grandson Nehemiah Baker �5, grandson Nehemiah Reece �5. To grandson Aaron son of Nathan Baker �5 when they arrive at 21. Executors: Sons Joseph and Nehemiah. Witnesses: Daniel Broomall, Thomas Evans. Note: Daughter of David and Lydia Regester (ca 1730). This Lydia is a sister of Anne, who was the wife of Jesse Baker. Married: William Reese son of Hannah Yarnall and Caleb Reese. Later married Philip Mendenhall. Married: Mary Yarnall (b. Jan. 24, 1752/d. Apr. 22, 1825) at Middletown (Hicksite) Cemetery 2 days later. Mary was the daughter of Thomas and Margaret (Hannens) Yarnall. Note: A cooper by trade. He cared for wounded at Valley Forge and Brandywine during the Revolutionary War. BAKER, JOSEPH. Edgmont. January 6, 1787. February 27, 1787.To wife Hannah all estate absolutely except wearing apparel to nephew Methusalem Davis. 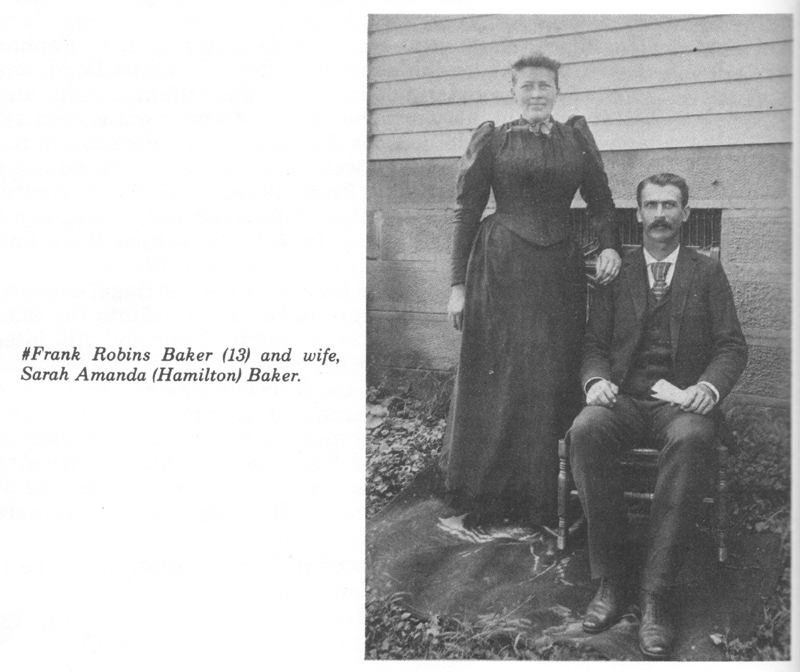 Executors: Wife Hannah, brother-in-law Joseph Baker. Witnesses: John Worrall, Jesse Haines. Buried: Middletown (Hicksite) Burial Ground on Feb. 2, 1817. Note: Letters granted Feb. 11, 1817, in his estate #1340 to Administrators William and Nehemiah Baker. Note: Nathan was a Farmer that moved to Chester County, Pa. around 1789. After Elizabeth's death, Nathan married Hannah Jordan (see below) before migrating to Washington County, PA. in about 1798 and settled in East Bethlehem township. Chester County Militia, commanded by Capt. Daniel Calvert and Colonel George Pierce-1780 and 82. Ref: Pa. Archives, 5th series, 5th volume, pp. 703, 796 and 849. Soon after settling in Washington County, Nathan returned to Chester County from Baltimore, MD, with a drove of horses, and while there took sick and died, and was buried beside his first wife, Elizabeth. From Beers: Nathan Baker was a resident of New Jersey, and lived near Philadelphia for several years, finally removing with his family to Chester county, Penn. Afterward he purchased a farm of 150 acres in Washington county, near Fredericktown, where he managed a mill, drove stock and carried on the work of the farm. Note: Elizabeth was the daughter of Aaron Baker (a son of Richard Baker). Note: Her maiden name was also 'Baker'. Note: Migrated with Nathan to Washington County, PA. Hannah was said to be the first white woman in Washington County. Residence: The old homestead on Fishpot Run. Residence: Settled in E. Bethlehem Township on a farm adjoining the old Baker homestead. Married: Mary Corwin of Amwell Township (b. Nov. 1, 1797/d. July 20, 1868). Children: Eunice, born November 15, 1818; Alpheus, born May 27, 1821; Stephen, born June 8, 1824; Sophia, born September 29, 1826 (deceased August 9, 1840); Asenath, born August 22, 1829; Enoch, born April 5, 1832; Zachariah, born December 19, 1835; Ruth, born November 11, 1837, and David, born August 20, 1842. Notes: Joseph passed his early youth at home, attending the rate schools, and assisting in the farm duties. When seventeen years of age, his father died, and he then learned the carpenter's trade of Spencer McKay, which he followed many years. He first purchased the Miller farm, comprising thirty acres, and in 1830 bought the place which is now the property of his son Zachariah, and here passed the remainder of his life. He was a successful business man, and his property represented the result of his own integrity, economy and perseverance. Politically he was formerly an Old-line Whig, afterward becoming a Republican. He and his wife were members of the Baptist Church at Mount Vernon. Click here for son Enoch Baker's (born April 5, 1832), Civil War Veteran's Card File. by their profession of faith on Oct. 1, 1834. Note: Enoch's mother died in 1794 when he was very young. He was a Blacksmith by trade with Nathan Pyle. He later worked as a journeyman with Christopher Slusher. He later purchased a farm on the road from Lone Pine to Ten Mile, where he spent the rest of his life. At one time he owned 55 acres in Amwell Township. In the 1850 Census, his real estate was valued at $8,313. Enoch was a Republican. Married: Abigail Ruble. 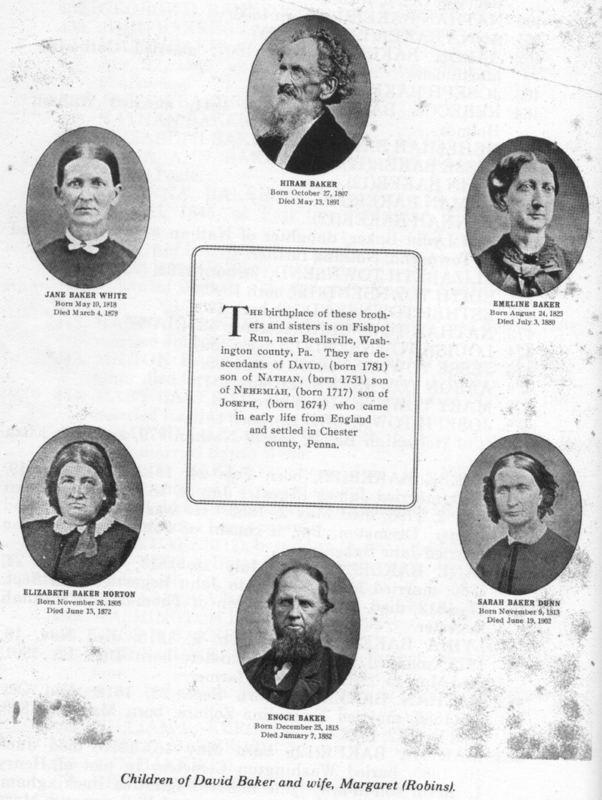 Their children were Levi, Lavina, David, Mary Ann, Albert, Malinda, and Hiram. Residence: On a farm adjoining the old Baker homestead. Residence: David and Margaret lived near the old Baker homestead on Fishpot Run, Washington Co., PA, until death. Click here for a rather frightful collage of David and Margaret's adult children. Born: Dec. 25, 1815 in Beallsville Township, Washington County, PA. Note: Enoch bought a farm nears Bakers Station on the old narrow gauge railroad between Waynesburg, Greene County and Washington, PA, known as "Sunset." Enoch was primarily a sheep farmer. He was a liberal supporter of the Presbyterian Church and active in community affairs, having held several township offices. 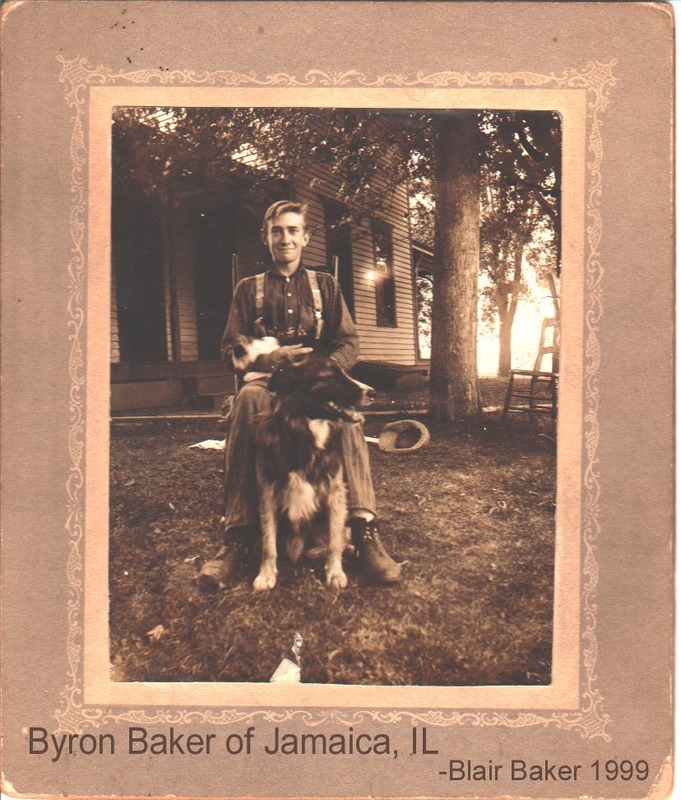 Click here to view the transcribed version of Enoch Baker's Last Will and Testament. Note: Daughter of Apollos and Elizabeth (Cooper) Speers. Click here for a picture of Margaret taken with her son David B. and his son Simon S. and his grandson Edward David Baker. Click here for Margaret's obituary from the front page of the Washington Observer. Note: She shared the headlines with the Titanic disaster. Married: Albert Voorhees (I have a lot on Voorhees. See the link at the top of this web site). Click here for a picture of Nancy Maria (Baker) Horn. Click here for a picture of J. Newton Horn with Nancy Maria Baker (1st wife). Click here for a picture of J. Newton Horn with Mattie Doak (2nd wife). Click here for a picture of J. Newton Horn's Civil War reunion. Amity Presbyterian Cemetery has an Infant Daughter Baker born Jan. 17, 1876 to D. B. Baker and S. (Baker). Married: Nettie Elizabeth Boggess (b. June 10, 1862/d. July 20, 1945) on Feb. 27, 1884 near Catlin, IL. (Nettie was the dau. of Perry and Mary Boggess). Children: Enoch P., Ralph Leslie, Charles Virgil, Froman C., Earl B. and Henry Raymond. Note: A twin of Charles. 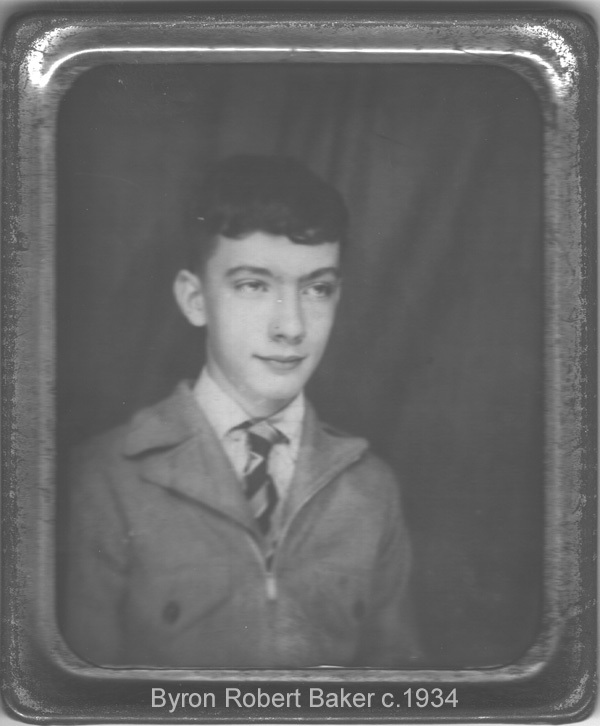 Henry attended schools of Amwell twp., Washington Co., Pa. until age 21. During vacation he assisted his father on the farm. He removed to Vermilion Co., IL, in 1879. He worked for Silas Clark 3 yrs. Returned to Pa., not satisfied, he returned to the west. 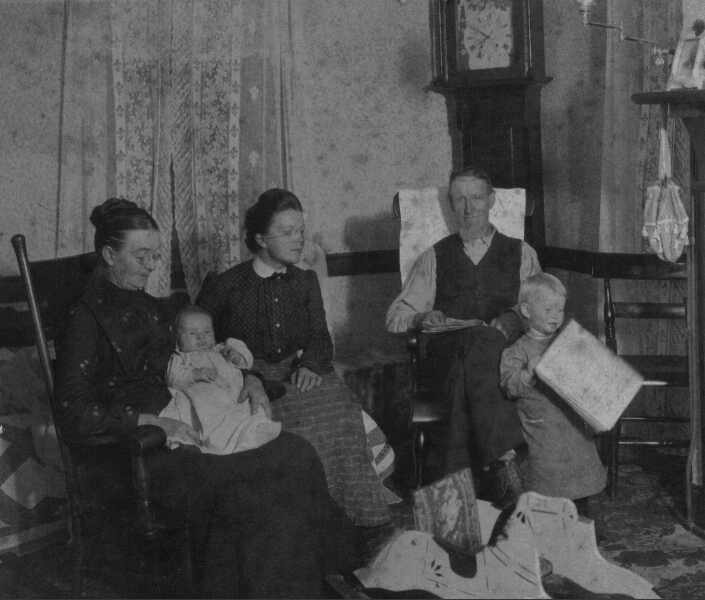 Henry and Nettie settled on farm now live (info from Past and Present of Vermilion Co., IL. 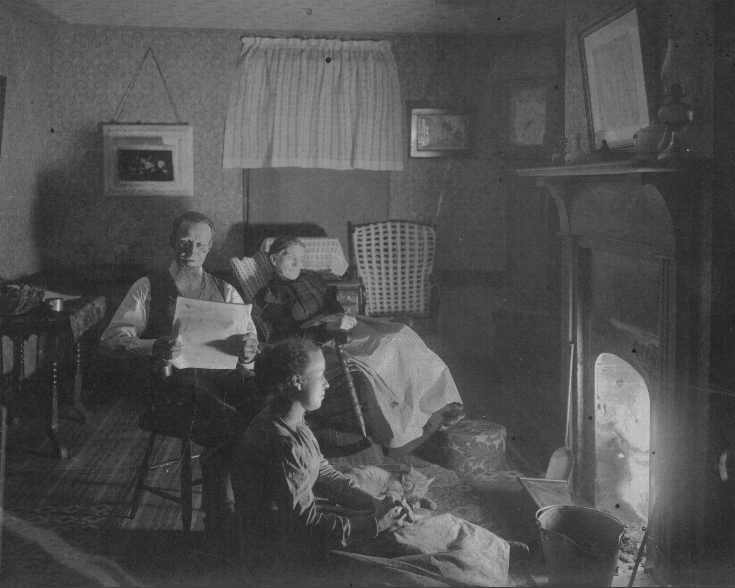 1903). Lived on sec. 24 Vance twp. 120 acres. (southwest of Fairmount, IL.) Raised Poland China hogs, horses, and cattle. Comfortable residence, large barns. Henry S. Baker was a member of Methodist Church. Note: A twin of Henry, Charles died at birth. 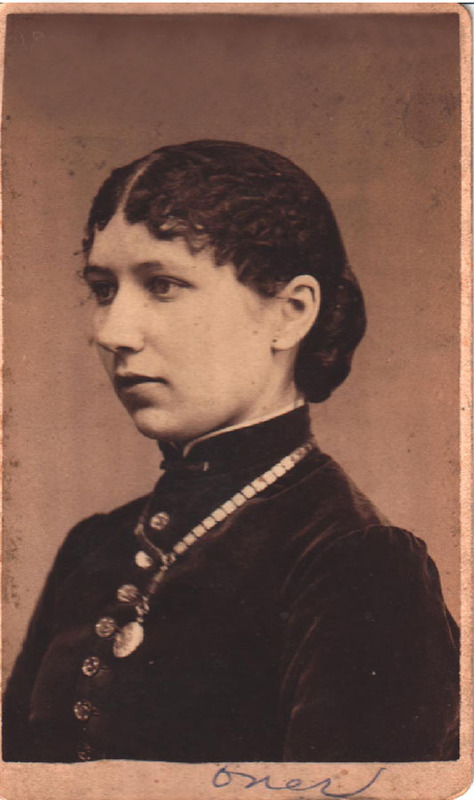 Note: After Sarah's death Frank married Winnifred L. McCleary (b. Nov. 2, 1872/d. Dec. 29, 1944) of Claysville on June 18, 1914. Winnie was born in East Finley Township, Washington County, PA, and was a public school teacher before her marriage to Frank. Click here for a picture of Frank and Sarah. Click here for a picture of the tombstone of Apollos, Sarah and Cora May Baker, taken at Woodlawn Cemetery. Also buried together at Woodlawn are Edith E. and Earl M. Brown. Note: Last Will and Testament info. available. Apollos was a farmer. From Diary Keep of Byron Baker: He migrated to Illinois on Oct. 13, 1874 from Washington County, PA.
Click here for a JPEG picture of Apollos Baker's Obituary as published in the Danville Morning Press. Note: the newspaper misspelled Apollos' name. The correct spelling is verified through the Diary of his son Byron, Apollos' personal farm transaction records, probate records, local research, and his tombstone. May 1886: A. S. Baker on board of directors of old Cannon school. (Cannon school was located 1 mile east of Jamaica, IL on southeast corner of first crossroads). 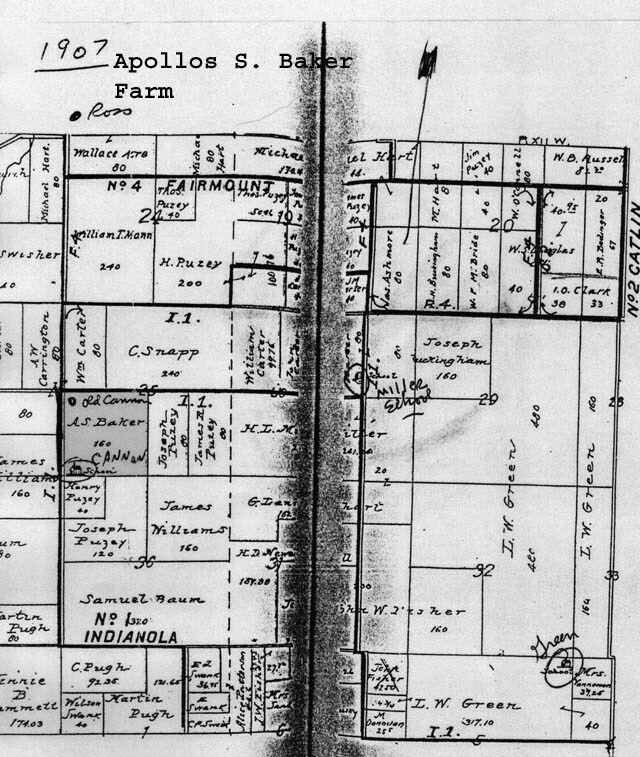 Apollos Baker lived where Earl Brown later lived. This house was on south side of the rd in sec. 25. This was a 2-story house built in the style of its era-probably late 1800's. E-mail me for pictures of the old homestead. Click here for an image of A. S. Baker's farm plat. Click here for a sitting portrait of Apollos Baker (probably taken while married to Clara). Click here for an image of Apollos and Sarah Long's wedding invitation. Click here for a picture of Apollos and his second wife Sarah (probably their wedding photo). 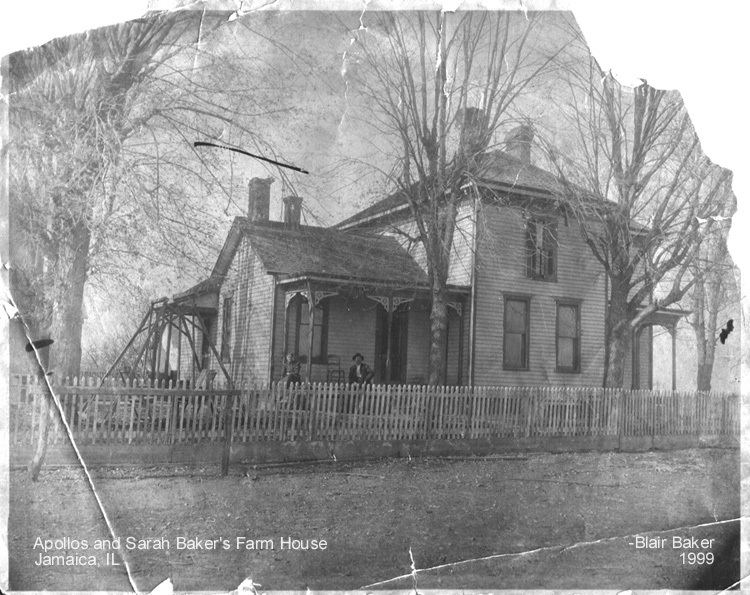 Click here for a picture of Apollos and his second wife Sarah on the porch at the farmhouse near Jamaica, IL. Click here for another picture of Apollos and his second wife Sarah on the porch at the farmhouse near Jamaica, IL. Click here for an image of a letter of condolence to Apollos, from his brother David B. Baker, after Sarah's passing. Died: May 17, 1888 (Aged 29Yrs, 11M's, 25D's). Buried: Mt. Pisgah Cemetery (earlier Concord) Georgetown twp., Illinois, next to her parents in the southwest part of the cemetery. Click here for a picture of Clara's tombstone, next to her parents, Silas and Nancy Clark, taken at Mt. Pisgah Cemetery. Note: Daughter of Silas (d. Jan. 11, 1894) and Nancy Unkn (d. May 6, 1888). Silas aged 71Yrs. 3M's. 14D's. and Nancy aged 59Yrs. 6M's. 15D's. Several Obituaries (see Catlin Clack) reference that Clara had been sick ever since her oldest was born. She died at the age of 30, just 11 days after her Mother, leaving 3 children, the youngest of which is 3 yrs. Clara's Mother Nancy suffered from paralysis, due to a stroke that affected her throat, and died of strangulation. Click here for a picture of the tombstone of Sarah's parents, Levi and Celia R. Long, taken at Mt. Pisgah Cemetery. Numerous other Clarks are buried here. Note: Cora died from Scrofula, which is a form of tuberculosis affecting the lymph nodes, especially of the neck, that is most common in children and is usually spread by unpasteurized milk from infected cows. For a JPEG image of a sketch done on Cora by an unknown friend, probably shortly after cora's death in 1896, click here for the Front Page, click here for the Back Page. Note: Byron managed Apollos Baker's farm until his untimely death from asthma. Click here for a picture of Byron's childhood home in Danville. Click here for a picture of Byron and his dog 'Shep' on the farm. Click here for a portrait of Byron Baker. Note: Daughter of Henry M. Blair (b. 11-10-1861 / d. 10-29-1912) and Katherine (Camel) Blair (b. 11-12-1860 / d. 12-13-1948). Known for smoking a corn cob pipe. Had a sister named Mabel (Blair) Beebe who resided next door on N. Franklin with her husband Horace Benjamin. Click here for a picture of the headstones of Byron, Lucile, Kate and Henry Blair, taken at Spring Hill Cemetery. 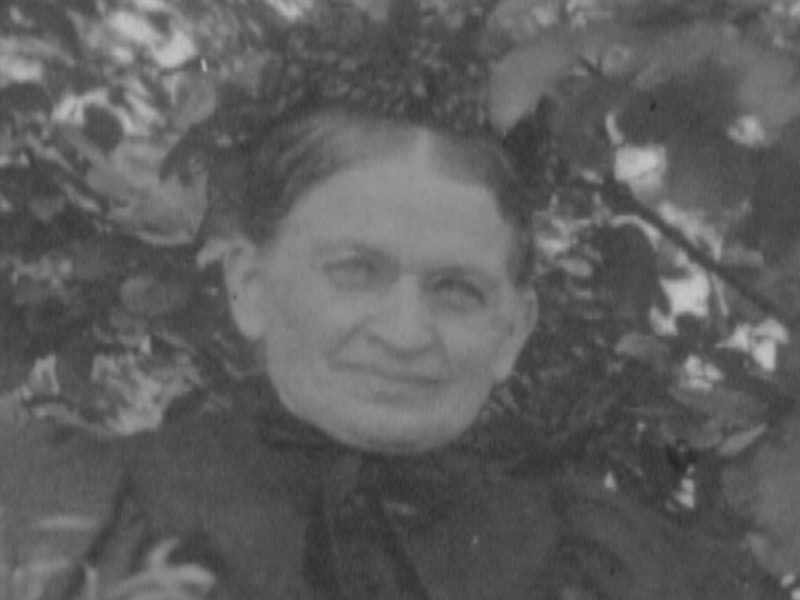 Click here for a portrait of Lucile's Mother, Kate "Mamau" Blair while teaching. Privacy Note: The following are living descendants in Texas. Information has been intentionally withheld to respect their privacy. Note: Attended Danville High School. Served in the Merchant Marines. Later a prominent civil attorney in Dallas. Click here for a childhood portrait of Byron Robert. Click here for a boyhood portrait of Byron Robert. 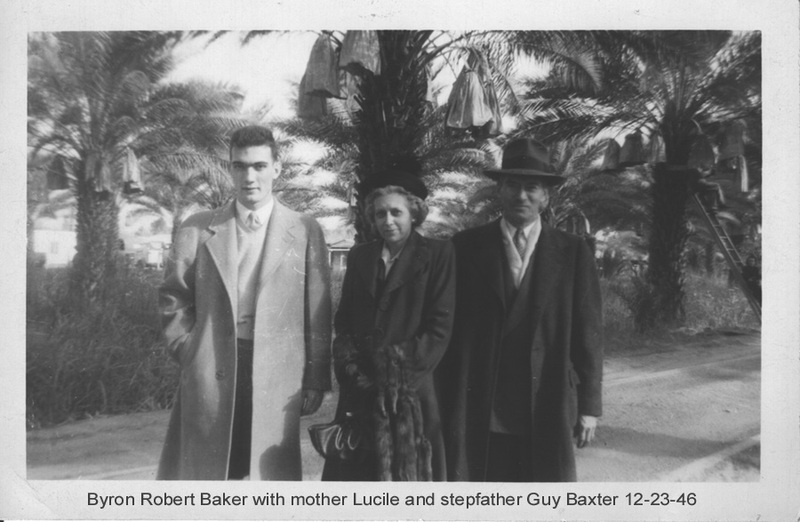 Click here for a picture of Byron Robert with his Mother Lucile and her second husband Guy Baxter. Click here for a portrait of Byron Robert at his law firm. 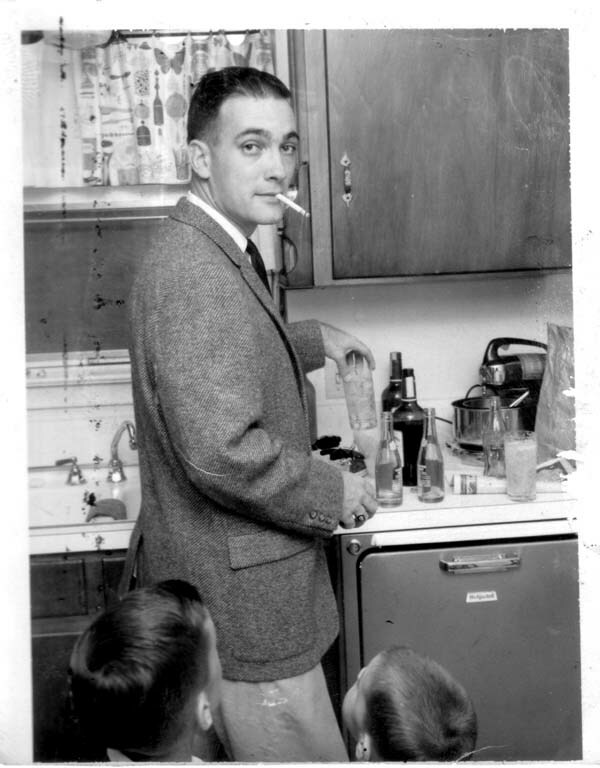 Click here for a picture of Byron Robert at home in Dallas after a hard day's work. Note: Jill passed away from infections caused by a suppressed immune system resulting from chemotherapy treatment for Leukemia. Her first son was stillborn at full term. She is survived by her husband and second son. As time permits, I will be adding valuable details of all of these fascinating people...so check back in the near future. Portions reprinted with permission from the author. Other genealogies included in this book are: McCullough, Taylor, Tharp, Turner, Wilson and some Craig, Dunn, Woodward and Zollars. Married: James Taylor McCullough (b. Sept. 30, 1906) at Methodist Parsonage, Waynesburg, PA. Note: I had the privilege of interviewing Ms. McCullough extensively about her work just before her passing. Family researcher and member of several local historical societies including the Fairmount/Jamaica Historical Society. (1) Click here for a JPEG map of Friends Meeting House & Graveyard, Middletown Township (Hicksite). This historic cemetery (currently Cumberland Cemetery) is located at 447 N. Middletown Rd. (1/2 mile north of Barren Rd.) in the town of Media, Pennsylvania, (Delaware County). Click here for a Google map of the location of this cemetery.